Love that flavour combination! And I hope you and Max are doing well – he is absolutely gorgeous! I am thrilled to see a post from you and I hope things are going well with Max! Please, details! :) Can’t wait to hear all about it! And this bread. Orange glazed rolls are the best. And pull-apart. 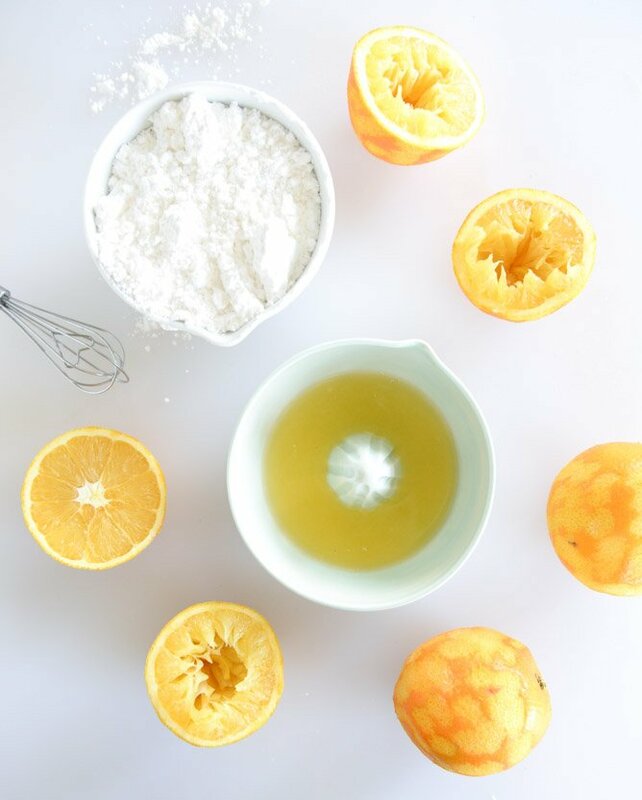 And that pour shot of glaze – just makes me want to drink it! Pinned! 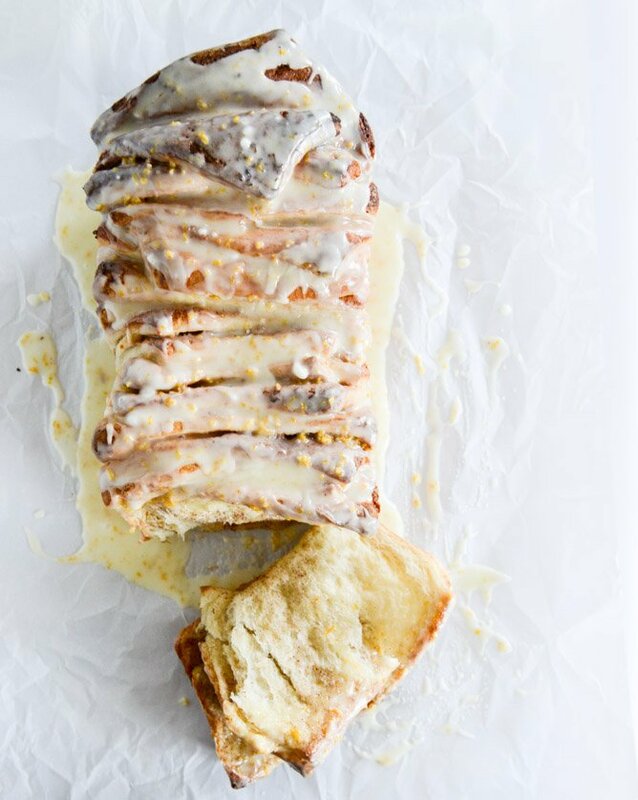 I did not expect to see anything from you today…and then it was this ULTRA FAB HOLY DELICIOUS pull apart bread. Why haven’t I made one of these ever? Oh ya, because it needs to be THIS. Pinned! Oh Love everything about this bread! I can not believe you have energy to post after having a baby. Sharing is caring even if it means making two. One for yourself and one for the family! Confession: Totally have a can of the Pillsbury rolls in my fridge right now! I don’t know what happened—I was at the store and they jumped in my cart. Love this twist on that classic. It still hits the spot every now and then. This would be perfect for Christmas morning brunch! I probably speak for everyone when i say that I’m dying for more pics of Max and details about how the first few days are going, but I also hope that you are taking tons of time to enjoy these first moments. I’m sure the last few days have been amazing (and maybe frazzled at times? Haha! ), and hope you are all doing well and loving every second! This bread. It’s nostalgia to me too. We make cinnamon rolls for every holiday brunch, and they are almost always the orange glazed ones from a can. I ADORE those. This… this has to be 1000x better! Looks incredible! Brilliant! I’m in love with pull apart breads and I’m always thinking of new ones I might add to the blog. This one never crossed my mind and it’s gorgeous! This bread is to die for! Can’t wait to hear all the details about baby Max. Yeah! HUGS! My monday is looking a whole lot better! This looks incredible! Pinned! Oh my goodness! I cannot wait to try this out, it looks and sounds absolutely delicious. sooooo gorgi!! not even an orange fan ova here, but I can def get behind this bread, so gooey!!! You are totally describing my childhood! 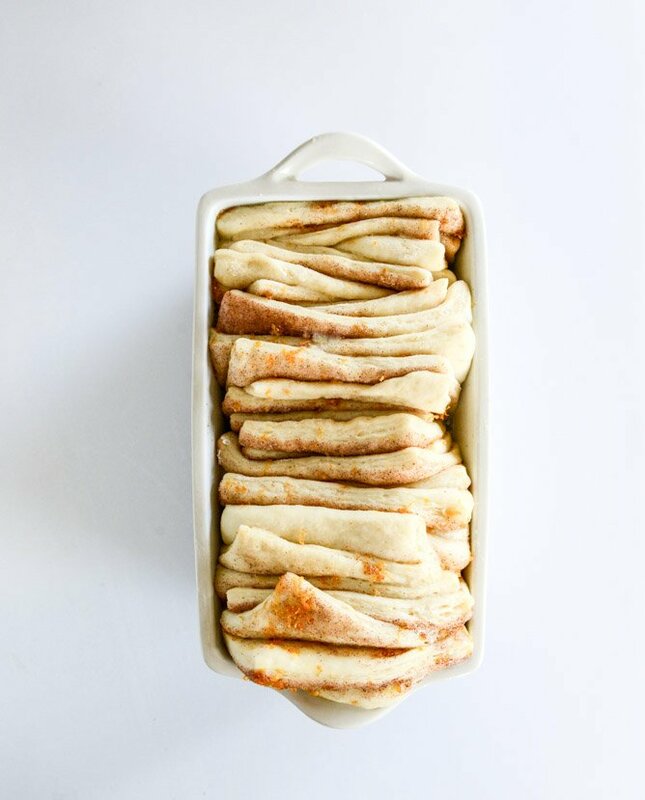 This pull apart bread will be happening at my house! Oh my WORD. I almost just licked my screen. Holy cow this looks so freaking good! Greatest pull-apart bread ever, LOVE the flavors! My husband and I went over your list of Christmas baking and selected 10 recipes to try. So far, we’ve made Gingerbread Maple Muffins (not on list), the chocolate peppermint cookies and the double chocolate cheesecake cookies. All three have been a hit :) We have a few more cookie recipes and the bacon almond brittle to try. I admit I’m afraid to make the baklava, but we did buy the ingredients. Thank you! yes!!! I’m drooling at my desk. 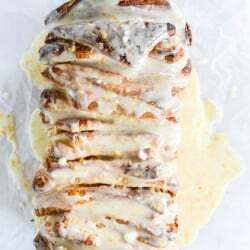 we had those Pillsbury orange cinnamon rolls every Christmas morning when I was a kid. So excited to bring everybody down memory lane this Christmas when I make your recipe!! I was obsessed with the canned rolls as a kid! Love this idea…but really, I’m far more interested in Baby Max ;) Hope you are feeling well! Sending lots of love your way! You have been in my thoughts…I hope you, Eddie and baby Max are all doing well and getting adjusted to your new lives together! It takes a few weeks to get into a routine with a newborn. This bread looks to die for! 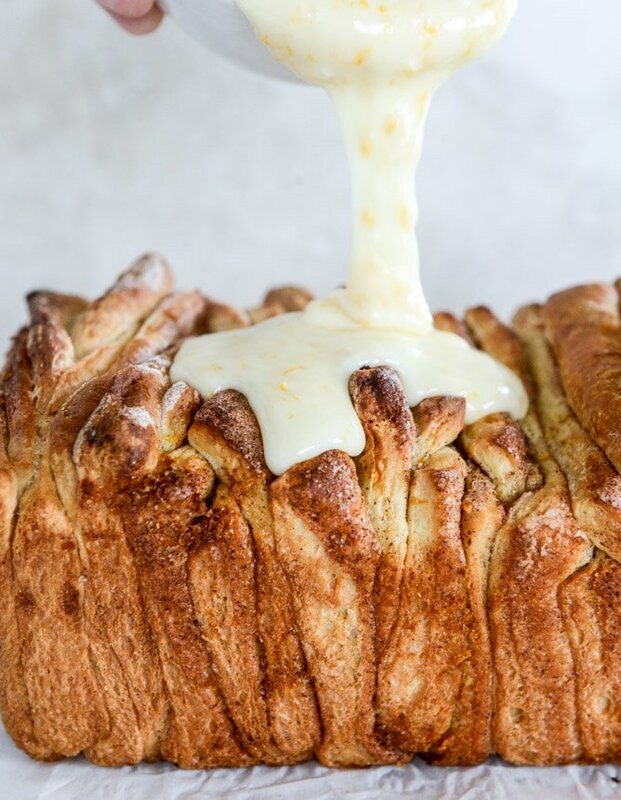 Ugh…you make pull apart bread look like it should be mandatory…this looks really, really good….can’t wait to hear more about the baby…so very excited for you! WOW! I really need this in my life. I’m drooling at my desk. Nooo! This looks so good, but I DON’T DO DOUGH. Maybe this recipe is a reason for me to once again tackle my kitchen nemesis. …Maybe the reason I can’t do dough is that, unlike some, I’ve never had a bun in the oven…okay, terrible joke, but once again, Congrats!! Wow, that looks incredible! Also, I can’t believe you’re already posting something new, and so utterly fabulous! 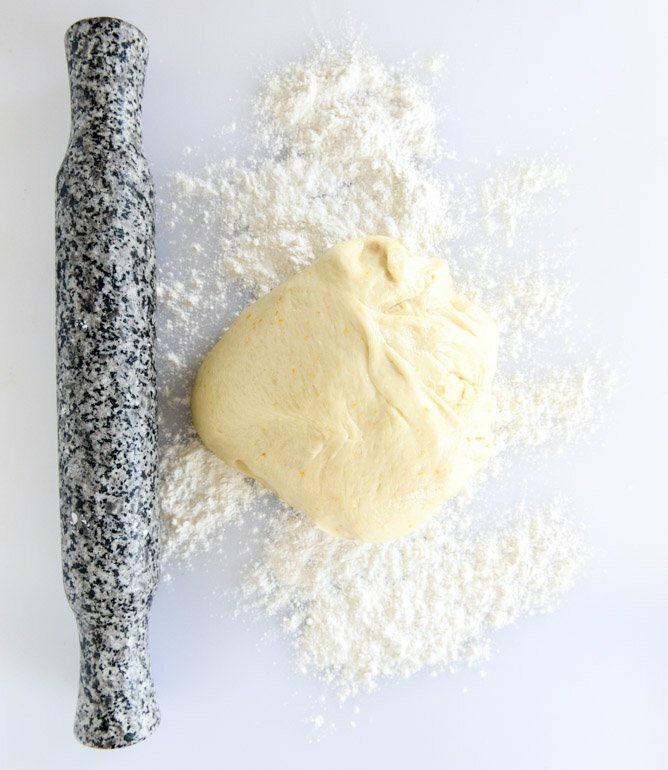 I NEED to make this bread ASAP! My husband loves the canned sweet orange rolls. I know he would jump right into this loaf. This bread looks amazing! I have been meaning to make pull apart bread for so long now! Duuuuuuuuuuuuuuuuuuuuuuuuude!!! I bow down to you for this one, for realz. Not only because this looks so insanely delicious, but also because of your description! 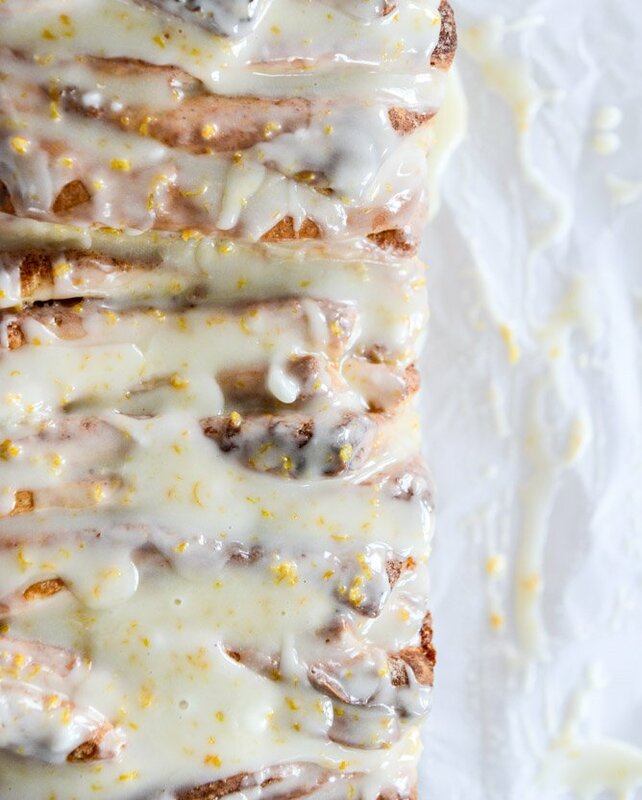 The orange cinnamon rolls in the can taste EXACTLY LIKE CHILDHOOD. They were also what I grew up eating as a kid, and they are still and will always be my favorite! This bread will now also become a Christmas tradition. I pair cinnamon with everything but hadn’t given much thought to the cinnamon orange combo.. Then the other day I came across this: http://immaeatthat.com/2014/12/01/vegan-cinnamon-rolls-center-halo-cups/ and now this?? I must give it a whirl!! 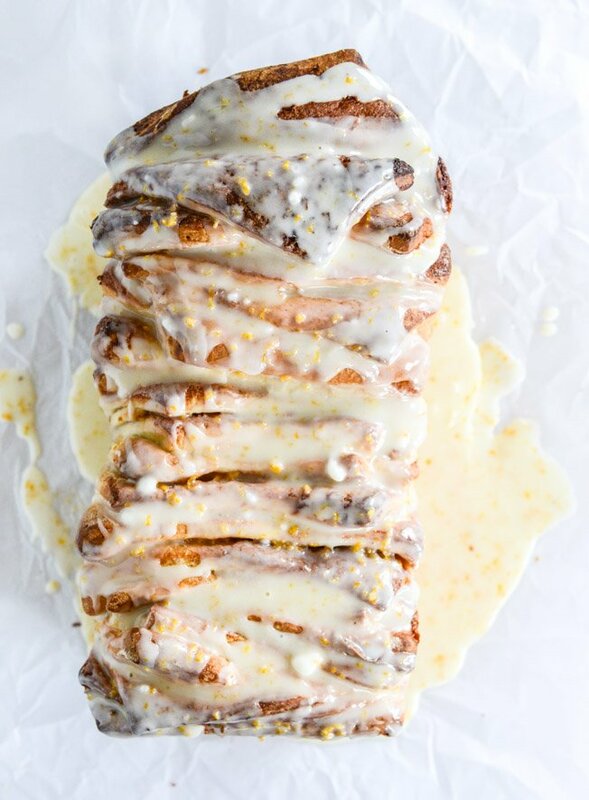 Cinnamon and orange together sounds so yummy. The only problem is that I would eat the entire thing by myself. Yum! Ahh Pull apart bread always looks so good! 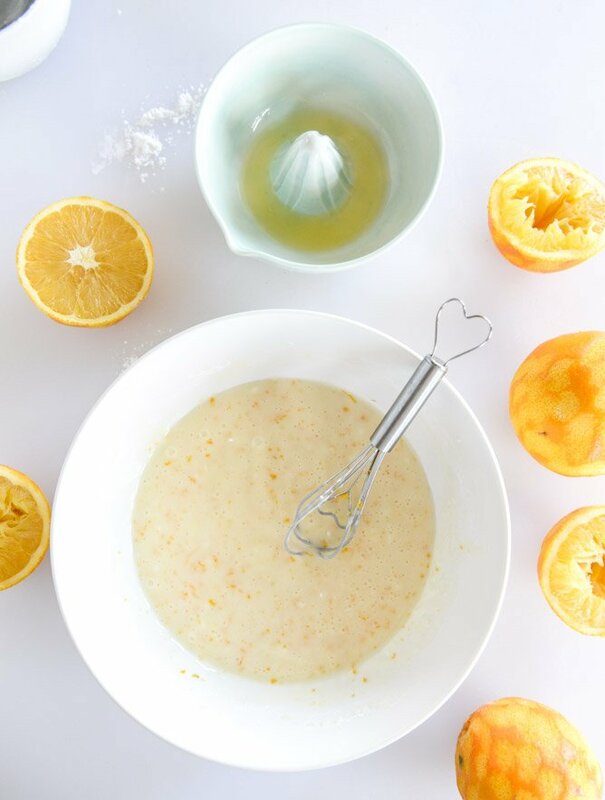 I love orange and cinnamon so I’ll definitely need to make this somtime! To bale it in the morning, do you refrigerate it after it after the second rise? i would refrigerate it right before you’d do the second rise – take it out in the morning and let it sit for 30 to 60 minutes, maybe even on your stove as the oven warms! 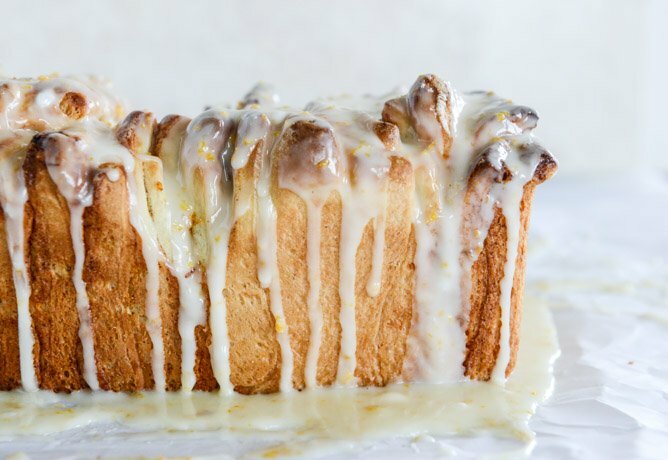 I have three sons (29,24 and 20) – those orange rolls were their absolute fave when they were kids :) I’m driving 6 hours to spend Christmas with them and think I’ll have to throw my Kitchen Aid in the car and make these. Congrats on your sweet boy – be prepared for lots of dirt, laundry, TMI, scatalogical humor and lots of love!!! This looks perfect for the holidays! Quick question for the busy mama – if i want to make it Christmas Eve and bake it Christmas morning, at what point do I stop/refrigerate? After the first rise or second? Should I let it come to room temp before baking? Thanks for sharing, can’t wait to try this! to make ahead – i’d make up until the point of the second rise. instead of rising the second time, cover in plastic wrap and stick in the fridge overnight. set out at room temp (maybe even on your stove as the oven warms up) for 30-60 minutes then bake. This looks SO good, however, to make this on any given morning, I’d have to wake up EARLY. Looks like it would take a LONG time to make. Can it be made the night before? Then baked in the AM? Or would it end up being too soggy? Thanks. I CANNOT believe you have time to post anything after just having a baby AND with the busyness if the holiday season. Hope you are getting enough rest. to make ahead – i’d make up until the point of the second rise. instead of rising the second time, cover in plastic wrap and stick in the fridge overnight. set out at room temp (maybe even on your stove as the oven warms up) for 30-60 minutes then bake! Any sweet with icing is delicious, very bad for the body but amazing for the tongue! Today you can see our wishlist. I can’t say I’ve ever had those orange rolls before. But it sure sounds delicious. And that glaze-perfect! I have neeeeeeeeeeeeeever had this before. Ever. I might want this right now in my mouth. I would love to make this on xmas morning. Can you make any of this ahead and keep in fridge? I just wanted to let you know that I made this ahead, as you suggested, and baked it Christmas morning. It was to.die.for. thank you so much for a wonderful recipe.